Sadie and Benedict are highly successful models with the Dreamkidz agency. At 1st, Ice Heaven seems just another product for them to advertise. But as millions of children round the world fall under the spell of it's 365 ice cream flavours, theme parks, TV shows and merchandising, they begin to wonder. What is it about Ice Heaven that makes all these children so happy, passive and well behaved. 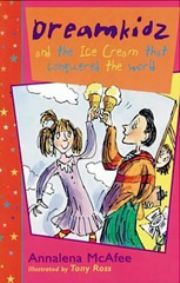 How Sadie and Benedict track down Ice Heaven's secret ingredient, Factor Lamda, and expose Algernon and Cynthia Goodchild, the wicked tycoons behind it, makes a wild, fast moving, funny and very contemporary story with a flavour of Roald Dahl. 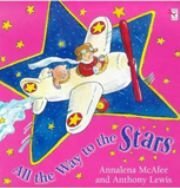 A picture book for small children who want to grow up immediately and do everything that adults do. It is the story of a little boy who doesn't like being told that what he wants to do is only for big boys, but comes to appreciate the value of familiar things, such as his toys and his mummy. 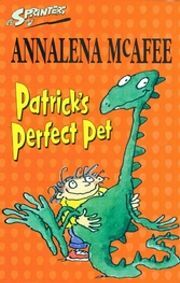 Patrick's pet is not a dog or a cat or a parrot, he's a dinosaur called Tiny! He's clever, kind, loving, helpful - the perfect family pet, in fact. The only problem is that Tiny doesn't stay tiny for very long!